1. What is Supermeal referral program? Supermeal referral program is our way to say thanks to our customers. Through this you can now earn Supermeal credit which can be used as a discount on every meal you order from Supermeal. 2. How can I participate in this? If you have already registered on Supermeal then you are automatically eligible to participate in our referral program (do not have a Supermeal account? Create Now!). Sending your private link directly. 3. How will I earn Supermeal credit? You will earn credit whenever your referred friend places an order on Supermeal and that order is accepted by the restaurant. 4. How much can I earn per order? 5. How can I avail earned Supermeal credit? Earned Supermeal credit can be used as a discount for a meal when placing an order to a restaurant which accepts Supemeal credit as a form of payment. 1. 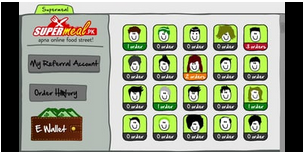 Supermeal reserves the right to change the referral program's earning potential at any time. 2. If any fake activity is detected then Supermeal can block your referral account and Supermeal credit in your account will be seized. 3. Supermeal credit can only be redeemed at restaurants which accept it as a form of payment. 4. Any earned Supermeal credit will only be valid for 1 year.